Perhaps the Paraprofessionalization of ARES/RACES will make the Radiogram a relic, but they are actually quite useful. 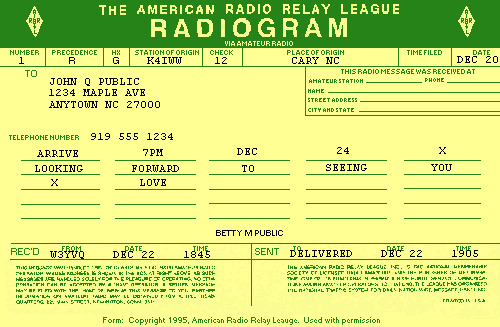 Having the discipline and skilled practice to communicate & pass traffic in Radiogram standard format is a basic skill I hope we never loose. This used to be in the old ARRL Net Operations manual that some DEC have (not sure of the exact title) [but appears to be] no longer in print. Now you can download it as pdf files. You can also buy these “Message Pads” from ARRL. http://www.arrl.org/catalog/?item=1320#top I have some of these, the yellow and green pads. http://www.arrl.org/catalog/?item=1310#top I don’t know how important these cards are. http://www.arrl.org/FandES/field/forms/radiogram2.pdf Printer friendly, less black. I have the above Radiogram form #1320 as an Excell file. I created that so that I could type into the blanks via computer, instead of hand writing the forms. At the suggestion of our ARRL Section Manager I added another tab, an ICS-213 message form. And a further suggestion from him, I created a third form, which is basically the preamble line from the Radiogram, and the body of the 213 form, making a form useful for both purposes. This is on a third tab in the same file. The file can also be used to just print blank forms, if that is wanted. A request for a copy of this file can be obtained by looking up my call sign at QRZ and emailing me with the subject line “Radiogram Form”.